The All-Terrain Vehicle (ATV) Bill of Sale is a legal document that proves the legal sale and purchase of an ATV. This document will provide information with regard to the seller, the buyer, the amount paid, all of the information with regard to the vehicle needed for sale and registration. Once the seller has received payment from the buyer, complete the document for appropriate proof of sale. How to Use an ATV Bill of Sale? 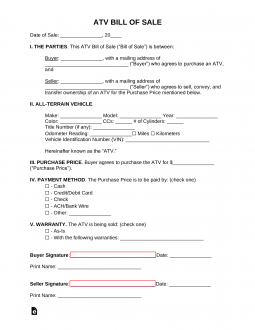 The All Terrain Vehicle (ATV) Bill of Sale is a legal sales document used to record the transaction of an ATV from seller to buyer. This document is necessary for putting the whole transaction on paper and clarifying the agreements of the sale (such as price, condition, warranties, deposits, etc.). This document may also need to be filled out before filling title transfer paperwork and registration, so make sure you have the proper form on hand by downloading it here (link). Not sure how to sell your four-wheeler or dirt bike? Read on to find out. Make sure everything is in working order. If there are any lasting repairs that need to be made, then it might be best to do them before the sale. That way you can get more interested buyers and better offers for your ATV. Put up ads online, on social media, in the newspaper, in auto and recreational shops and public notices. Also make sure to pass the word around to friends and family to reach as many people as possible. Now you will need to make sure there are no liens or encumbrances on the title. This way you can clear it and prepare it for transfer to the new owner. Also, make sure you have the most up-to-date registration information so that you can include that on the bill of sale. Once you have buyers looking to buy, negotiate a final sales price. Chances are you won’t find too many people willing to pay the advertised price up front. So plan according to that until you come to a price you can both agree to. The buyer will probably want to inspect the ATV themselves and/or through a certified mechanic to make sure there are no unknown mechanical problems or concerns. If all looks good, then the purchase can be finalized. And once the full price is paid, the title can be transferred to the buyer. Then the new owner can file for registration through the local DMV.